Spectacular designer decorated 2 Bedroom / 2 Bath townhouse. Has unmatched views of Ocean. Has private entrance to the front and back. Nestled in the natural dunes of Florida's most beautiful beach (Travel Magazine); this upscale townhouse is located on the much coveted "no driving" end of the beach. 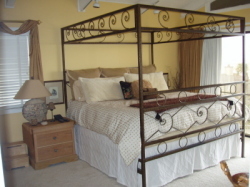 You can relax in your king sized master bedroom, and enjoy the fantastic ocean view while never leaving your bed! The views are gorgeous! Beach is just steps away! 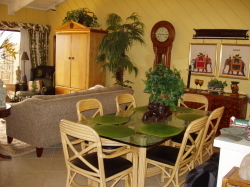 Kitchen, dining, master bedroom and living area all offer beautiful ocean views. Second bedroom has twin beds with a fantastic bathroom and overlooks the large private pool. New Smyrna Beach has some of the finest dining and entertainment around. With its central location activities are endless. For you fishermen and women, besides ocean fishing right out your back door. There is the Mosquito Lagoon known for its famous redfish flats fishing, not to mention the trout, tarpon, snook, snapper and flounder. Located in the much sought after "Sea Dunes" town homes. They are quaintly built into the natural sea dune scape. No ugly high-rises here! That means no over-crowding on the beach. Plenty of space! 1 hour east of Orlando and the Theme parks. 20 minutes from Daytona Beach. 40 minutes from Cape Canaveral.